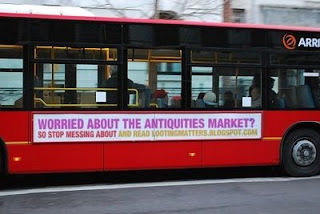 Looting Matters has taken out advertising on London buses in a bid to popularise the debate about the antiquities market. This has generated a huge amount of interest. The initial service is serving Gower Street and the museums in the Bloomsbury area. "We should give it all back", said Sheila Jones, 52, of Ealing, West London, while waiting for the 29C service. Martyn Ffewkes-Smith, 26, was even more enthusiastic. "I pulled out my iPhone and looked up the site. I had never really thought about the issues before." The advertising is being rolled out from the start of April. While "Looting Matters" is unable to comment on the financial backers for the project, the design team at CMH Associates are delighted with the finished campaign. That's great. I look forward to seeing it around. COULD WE HAVE SOME MORE INFORMATION ON THIS MATTER,ESPECIALLY AS REGARDS HOW WE CAN HELP? I mentioned this and even showed the image at the end of a talk I just finished giving (about Roman Art History and the antiquities scandal) at the Roman Archaeology Conference at Michigan and was told by an audience member that I'd been duped by an April Fool's Day joke. True? Please check the date of the original posting. For the record I must add this link from CultureGrrl.